Cologne Royale ~ "Cologne Royale is an exceptional Cologne, inspired by the Royal Courts of the 18th century, of which Mr. Dior was so fond. “An exercise for a Perfumer, wherein the quality of a fragrance entirely depends on the quality of its ingredients, and its citrus fruits, in particular.” says [perfumer] François Demachy." With notes of bergamot, lemon, neroli, mint and sandalwood. Leather Oud ~ "Highly powerful, vibrant and deep, Oud Wood is rare and particularly recognizable by the leather scents that it diffuses when burned. Using this unique wood, François Demachy created an intensely masculine fragrance, with strong character in which Leather notes intertwine with those of Gaiac Wood, Cedar and Sandalwood." Additional notes for the woody leather fragrance include cardamom and clove. Granville ~ "The House where Christian Dior spent his childhood is located in Granville, in the Normandy region. Built overlooking the cliffs, it is surrounded by pine trees and has a view of the sea. Inspired by this site that is so dear to the Creator, François Demachy chose to create a fresh, invigorating and aromatic fragrance. “I not only wanted an aromatic fragrance, as the estate has an abundance of pine trees, but also one that is exceptionally invigorating and extremely fresh...” The notes for the spicy aromatic include pine, thyme, rosemary, lemon, black pepper and sandalwood. New Look 1947 ~ "February 12, 1947: A major event was held at 30, avenue Montaigne in Paris, where Christian Dior presented his first fashion show. With his flower women and bright colors, the Designer launched a fresh fashion trend. “It's a New Look!” exclaimed Carmel Snow, Editor-in-Chief at Harper's Bazaar, thus christening the Designer’s inimitable style. Today, the New Look has become an explosive, generous, ultra-feminine and floral fragrance." The notes for the spicy floral include tuberose, benzoin, ylang ylang, rose, jasmine, vanilla and iris. Mitzah ~ "Christian Dior loved and thus surrounded himself with women. When he arrived in Paris, he met the woman who would later become both his muse and advisor: Mitzah Bricard, an extremely sensual woman, with a divinely chic allure and captivating presence. François Demachy has paid tribute to this lady, by creating a fragrance that bears her name: a mysterious, captivating spicy oriental perfume." The notes for the oriental include rose, patchouli, coriander, cinnamon and frankincense. Milly-la-Forêt ~ "After his fashion shows, Christian Dior loved to get away from high society Parisian life in order to recharge his batteries at his home in Milly-la-Forêt. “Hidden away from the world and surrounded only by my flowers, my canals and my small pond, I can listen to the sound of the Milly bells in peace.” he writes. Wandering through the surrounding woods, François Demachy imagined this fragrance as the embodiment of a romantic walk in the forest, with a fresh, tender and cottony scent. The notes for the musky citrus include orange blossom, jasmine, iris, mandarin, neroli, white musk and sandalwood. Vétiver ~ "Mr. Dior had a particular sense of elegance and sophistication. Inspired by this and his timelessly chic style, François Demachy has created a powerful, intense and raw Vetiver fragrance. A masculine raw material par excellence, Vetiver makes up more than one third of the fragrance and is combined with Coffee, a round, slightly bitter, roasted note, creating an unusual aromatic blend." The woody aromatic features notes of grapefruit, coffee and vetiver. Octavian at 1000fragrances has done many wonderful reviews of these. Someone of them sound wonderful! Are they available in the US? Yes, you can buy them at the website and would assume they’re also in Dior boutiques. Yes, they are great reviews. I think, from memory, he discussed Miss Dior in one of them, presumably the review of New Look. Really interesting. Seven new fragrances??? I can’t say that any of these screams “Buy me” but it will be interesting to see how they hold up against other collections. They’re a little late to the game. I don’t know the distribution…that is, whether or not they’ll be at Dior counters or only at Dior boutiques. If the latter, would guess they’re going to get less play in the US only because there aren’t that many Dior boutiques here. Same for Germany – I wouldn’t know where to find a Dior boutique (probably Berlin) whereas I have the Hermes store just around the corner. R.I.P. cologne blanche, you have served me many summers. it’s a bit odd that main line dior infiltrated what was the men’s boutique fragrance series…. More likely they decided to give some exposure to that series by pulling it into the main Dior fragrance line — really, even many perfumistas were not familiar with those Dior Homme colognes. I find the whole thing more than a bit odd! As you point out, many were not familiar with the Dior Homme colognes, because Dior gave them such poor distribution and promotion. In my opinion, the original three were probably the best exclusive trio launch in a very long time… and maybe ever! After 3-4 years of letting them languish and become harder to find, they add the very disappointing (to me, anyway), woody-amber-dominated Ambre Nuit, while seemingly discontinuing the three good ones. Now they include the two I’d drop (Bois D’Argent and Ambre Nuit) in the new collection and leave out the beautiful and different Cologne Blanche! (Because of heliotropin restrictions?!) At least my beloved Eau Noire made the cut – although it’s the only scent to get left out of the promotional picture! At least I quite like a few of Demachy’s scents, so I’m trying to hold on to some hope…. It was odd what they did w/ the Cologne Collection, truly. I first smelled them in the New York Dior Homme boutique, where they had them hanging around by the cash register as an afterthought. Perhaps they were given more attention elsewhere: we all forget that North America is no longer the cash prize for most perfume brands. I can testify Milly-la-Forêt was a lovely place: as a child, I used to spend most of my holidays around Fontainebleau and I was taken to Milly several times. I expect it’s all built up now. That part of France was idyllic. This scent appealed to me instantly as well, in a way the others (from thei rlist of notes) did not. I’d love to try it! you have the voice of an angel! I didn’t even know about it! Just added it to my bookmarks. Very cool, Bela. I wouldnt mind trying a few of these, but the Dior Homme colognes were never in the boutiques that i saw, so i dont expect these to be either. Mitzah sounds a bit intriguing, however it’s not really I foresee myself purchasing. Samples are definitely in order, but none of them really grabbed me, either. Maybe the vetiver, but even that’s more of a ‘maybe’ than anything else. I’m sure they’re well made and lovely, but not on the top of my must try list. The only one of these that appeals… and I have to admit that it does REALLY appeal to my girly taste… is New Look 1947. It’s still probably out of my price range, unless I manage to locate a split. I hope the bottles are pleasant to hold, because they are certainly very utilitarian-looking. contact Monica—she may still have some available. Mals, that one appealed to my girly-girl, too. I’ve tried Granville —not impressed. Tends toward masculine and reminds me floor cleaner. I had especially high hopes for Milly-la-Foret…..synthetic floral and a bit of chewing gum. disappointed sighing ensued. However, I am still hopeful for Mitzah and the leather which I’ll hopefully have my mitts on soon. I think you will be happy with Mitzah and Leather Oud.. although Vetiver and New Look were definitely a few of my favorites from this collection. Now if I can just hurry the plane that is carrying my 450ml bottle of Mitzah…. Daisy, any decants in the offing for Mitzah and/or Leather Oud? Good to know, thanks, given that I’ll probably never get to try them. OK, now I’m depressed. Oh well. However, since I am an optimist, I’ll STILL try Milly and hope for the best, but I’ll do it with a restrained sniff. I should probably say that for the most part—Dior is not my favorite house…only a couple of their offerings have appealled to me, so this new line was sort of a long shot anyhow. But don’t be depressed!! There are so many lovely, perk-you-up florals that you haven’t smelled yet! I sure we can find something that will snap you out of this blue mood! Whatcha like?? A collection like this cries out for a discovery set or sample pack… any sign of that? My small decant of New Look 1947 turned up today. It is extremely lovely and seems very well put together, although not my style to wear. Whilst I am looking forward to decants of Leather Oudh and Mitzah I admit to some unease relating to the slightly derivative style of this collection. Please let us know how the Leather Oud and Mitzah turns out. As a whole, with the exception of Poison, I think Dior produces some well done fragrances. I like J’adore and I am not a particular fan of friuty florals. My decant came too and I’m infatuated, it’s a lil’ dear! I could wear this happily and I was pleasantly surprised how much I liked it. I am looking forward to LO and Mitzah now and especially because of Octavian’s raving reviews of them. He also loved New Look so I’m thrilled he didn’t steer me wrong. I put on vtg. Miss Dior last night just to remind myself and yes! It is a classic and my favorite for so many reasons. Have also been seriously lemming these ever since Octavian’s reviews. Hoping one – and only one! – will turn out to be my type. Hard to imagine they will tip Miss Dior, though! NozKoz NOTHING could ever replace or even stand beside Miss Dior. Get Behind the lady , all of you! I love her. But I think New look was lovely and was just as Octavian described, floral, creamy, powdery . I hope one of them suits you and I want to know which one (if any?) catch your fancy! Wow. If I were Chanel I’d be flattered and a bit tweaked. 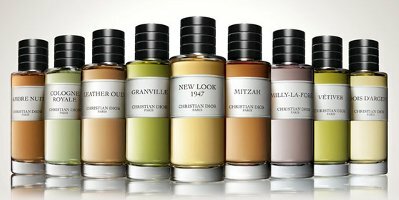 I know lots of people have done their own version of the Exclusifs, but Dior seems to have borrowed from the bottles, the kind of scents available, and even the copy! Still interested in sniffing though! But the bottle is nearly the same as the Dior Homme cologne collection bottle, which pre-dated the Exclusifs bottle, although of course Chanel was using that square bottle w/ the labels on some of their scents already. I think if you went back far enough though, somebody else was probably doing something similar…really doubt Chanel “owns” the look. That’s true about the bottle, R. Guess I was also thinking of the way they’ve included a vetiver (like Sycomore), a cologne (OK, everyone does this, and the perfumes based on the locations/houses (like La Pausa, and Rue Chambon) though I suppose everyone does that, too! Oh, that’s true too! Yes, these collections all look alike at this point, it’s true…and add the new Van Cleef Arpels set in there too. They all seem out to “cover all the bases”. I am always interested in sniffing. If I am not on tomorrow due to last minute shopping, everyone have a nice Thanksgiving! Maybe it’s just the PMS talking, or the combination of pharmaceuticals I just ingested, but I’d rather have Dior focus their money on un-reformulating their classics. Or maybe I just have new release fatigue. Just got some Granville today and think it’s pretty wonderful — would agree with tending toward masculine, as Daisy said, but definitely not Pine-Sol-esque on me, thankfully It’s essentially what I hoped it would be from the description and Octavian’s review at 1000fragrances (aromatic and bracing), so I’m pleased and already thinking I perhaps didn’t get enough of it. Will be trying the Leather Oud as well. Dior is not my favorite house, but I’m glad to have given Granville a go. Personally, I’d Love Dior to Relaunch Diorling or Diorama to a wider audience… now those Sound like EXCEPTIONAL Fragrances…. BTW… does this kind of a little smack of “Les Exclusifs” by Chanel or is it just me? I hope this means better distribution. The way I’m skimping on my eau Noire decant I’m going to need a full bottle sooner or later. Wish they did a slightly more reasonable size than 125 ml, though. I want them all just to have on my bathroom counter. This collection is now named La Collection Privée Christian Dior (as per Dior’s official Facebook page). Oh, and the concept visuals are also on the page – they are really clean and beautiful.